Modern wireless high-speed data networks use tightly grouped channels and complex modulation schemes to enable transmitting vast amounts of data. This in association with ultra-sensitive receivers may face unanticipated but serious capacity losses if the network is disturbed by Passive Intermodulation or PIM for short. Generally, modulating RF signals is necessary to transport information, but arbitrary passive intermodulation can significantly impact RF signal performance. 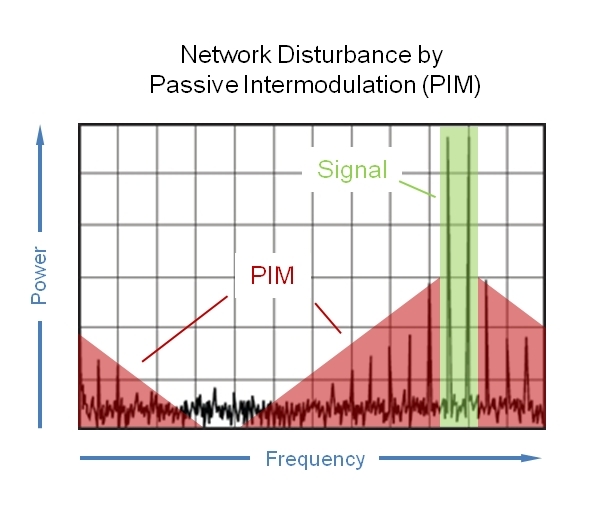 Unfortunately, PIM can happen whenever more than one signal is channeled through one RF path. As a result, we may see unwanted non-linear frequency responses of passive components including connectors and cable feeds. These components start acting like mixers, modulators and frequency multipliers creating unwanted spurious products.